Shopmobility Watford is an accredited partner of Acorn Stairlifts. 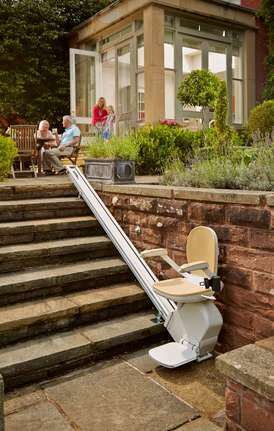 Stairlifts available for indoor and outdoor use. New, refurbished and rental options available. Fits quickly and easily to your stairs, not the wall. For further information on stairlifts please complete this form; your information will be sent directly to Acorn Stairlifts who will contact you. Acorn Stairlifts come with a fully comprehensive 12 month warranty. After that, there are different cover plans available to suit a range of budgets. All of Acorn's stairlifts have been independently tested and certified to comply with the newest European safety standards for stairlifts. Shopmobility Watford will receive a referral fee if you subsequently make a purchase. (This does not affect the purchase price).